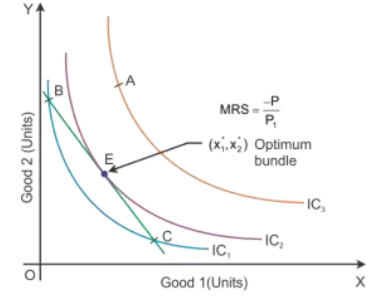 A consumer will strike his equilibrium at the point where the budget line is tangent to an indifference curve. Equality of marginal rate of substitution and ratio of prices: When the budget lines is tangent to an indifference curve at a point, the absolute value of the slope of the indifference curve and of the budget line are equal at that point, i.e. 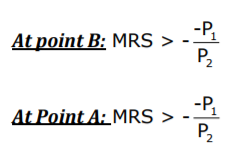 MRS is equal to the price ratio. The slope of the budget line is the rate at which the consumer can substitute one good for the other in the market. At the optimum, the two rates should be the same. Thus, a point at which the MRS is greater, the price ratio cannot be optimum, and when the MRS is less than the price, the ratio cannot be optimum. originally purchase, i.e. x1*, x2* shows the optimum bundle. "Rules and regulations are required for the protection of the consumers in the market place". Justify the statement with arguments.